Summary: In the mid-1990s, electricity generator National Power joined the small club of companies that ran their railfreight services using their own locomotives. Six class 59 locos and two batches of hoppers (totalling 106 wagons) carried a distinctive blue and grey livery on services centred on the giant Drax power station. The operation was short-lived, being sold to EWS in 1998. The rolling stock has seen more widespread usage under its new ownership, with many of the wagons being rebogied and renumbered. History: National Power was one of three electricity generating companies formed by the privatisation of the Central Electricity Generating Board in 1990. It was a major railfreight customer, relying on coal deliveries for many of its power stations. Quite early on the decision was made to operate these trains themselves, as well as trains of limestone for use in flue gas desulpherisation. An order was placed for a diesel locomotive (59201, delivered in February 1994) and a batch of 21 bogie hopper wagons. Prior to the delivery of the new wagons, 22 Tiphook hoppers were hired for trials carrying limestone between Tunstead and Drax Power Station . The new wagons were built by Powell Duffryn SA in France and the first, NP19400, was delivered by train ferry in November 1993 . Coded JHA-P to design code JH022A, this was the prototype and initially featured standard drawgear at both ends. The plan was for NP19401-19404 to be outer wagons (coded JHA-O to JH022B) with drawgear at one end only. The rest of the batch (NP19405-19420) would be inner wagons coded JHA-I to JH022C. NP19400 was expected to be converted to an additional outer wagon in due course. 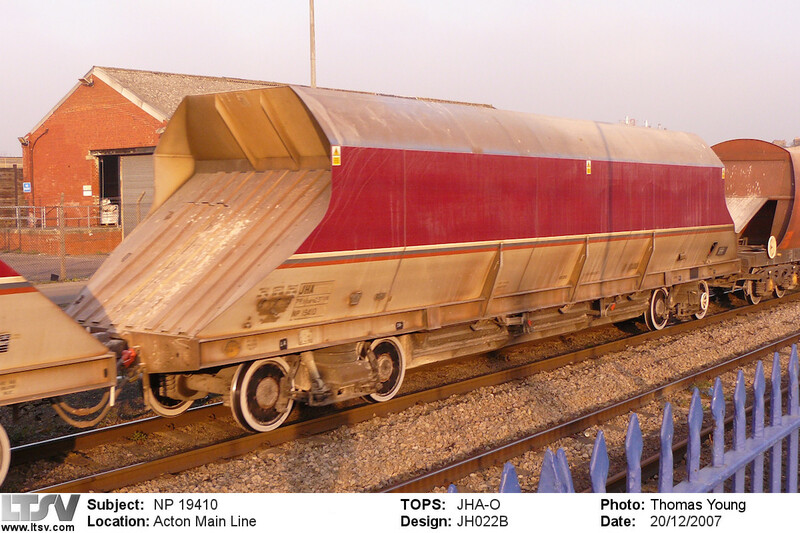 The wagons were similar in appearance to the ARC JHA wagons built in 1990, and were also carried on inside-frame low track force bogies, in this case Powell Duffryn LTF-25s. The livery was radically different however, comprising mid-blue on the upper parts of the hopper sides, light grey elsewhere, and a white/blue/red cheatline between. 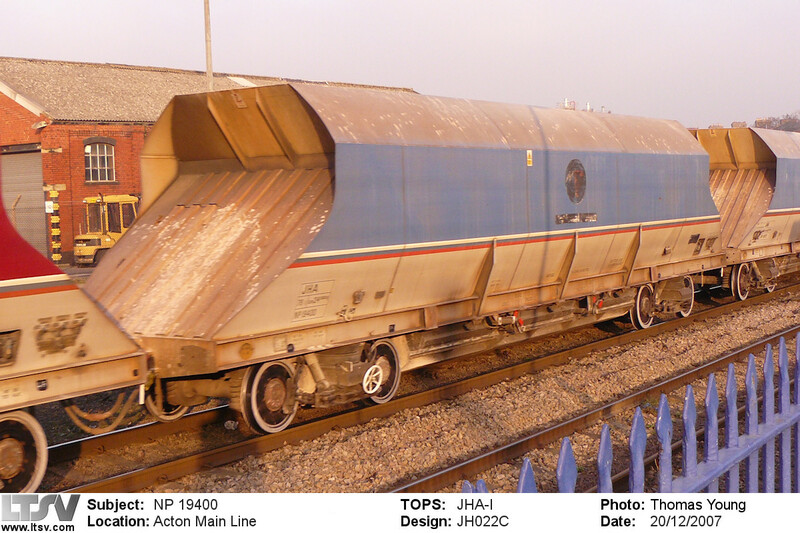 Apart from its conversion to an inner wagon, and the removal of the National Power logo and lettering, prototype NP19400 was still in original condition when seen in aggregates use at Acton Mainline, 20th December 2007. The production batch was delivered and entered service at the end of April 1994 . The limestone services did not run every day and the wagons were reported to have also been used on aggregate trains for ARC, covering for their own JHA wagons temporarily withdrawn for axle checks . In the meantime, National Power was also developing plans to run its own coal trains to Drax Power Station. Trials had taken place during autumn 1992, again using Tiphook KPA bogie hoppers . A further 5 class 59s were ordered (59202-206, delivered in August 1995), along with a batch of 85 hopper wagons. The first of these (NP19601) was delivered in May 1995 and was initially reported to have been built by Powell Duffryn and allocated TOPS code JHA and design code JH023A . New TOPS code JMA was soon issued for these wagons, JMA-I (design JM001A) covering the inner wagons and JMA-O (JM001B) the outers. Although the wagons carry Powell Duffryn builder's plates, they were actually built by OY Transtech of Finland, imported via Immingham in kit form, then moved by road to National Power's depot in Ferrybridge for final assembly . The JMA coal hoppers were broadly similar to the JHA limestone wagons but were noticeably longer (at 65ft ), and lacked the 3 vertical strengthening ribs. The batch was numbered NP19601-NP19685. (The logical numbering of NP19501 upwards was not possible due to Blue Circle PGAs APCM19551-APCM19589. However, it is not clear why the numbering started at xxx01 while the JHAs were numbered from xxx00). At least 10 wagons were outers, these being (by 2005): NP19606/14/25/26/32/39/45/51/59/64 . Also by 2005, wagon NP19650 was unique in having conventional drawgear at each end , being coded JMA-S to design code JM001C . It is not known whether this was its as-built condition or a later modification. The JMAs were mainly used between Gascoigne Wood (the loading point for the Selby coalfield) and Drax Power Station, but also from other collieries and Immingham docks, and to Eggborough Power Station . They may have also seen use on the limestone traffic from Tunstead, while it is known that the shorter JHA wagons were sometimes used on the coal duties. 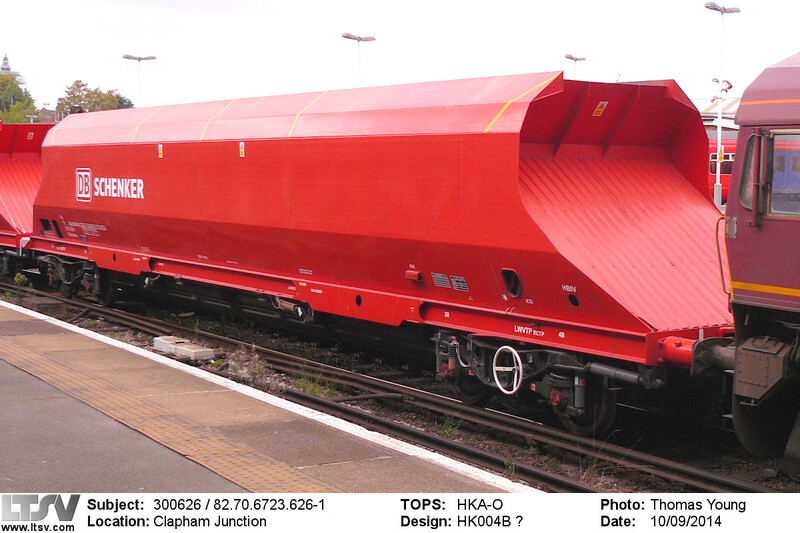 The JMA design was later used as the basis for a large batch of coal hoppers for Freightliner (TOPS code HHA). In 1998 National Power sold its rail operations to national freight operator EWS (National Power itself ceased to exist in 2001 following a demerger). JMA wagons NP19602 and NP19655 were modified at the Thrall Europa works in York in 2000. The angle of the discharge slopes was altered in connection with development of the HTA coal hopper design for EWS . Later lists show the design codes of these two wagons as being unchanged. In 2002, new TOPS codes and number batches were assigned for the wagons (HJA-I/HJA-O 300400-300421 for the JHAs and HKA-I/HKA-O 300601-300685 for the JMAs). TOPS code HKA-A was also issued, being listed as an 'Aggregate Hopper, Bogie', whereas HKA-I and HKA-O were specifically for coal hoppers . Since no aggregate hoppers have been coded HKA, perhaps the HKA-A code was intended for the double-ended NP19650. It was to be some years before the new codes and numbers appeared on the fomer National Power wagons, although some of the Marcon JHAs (also bought by EWS in 1998) were renumbered as HLAs in the 3007xx range from early 2002 . The identities of the JHA-O outer wagons were now NP19406/10/13/14, suggesting that some rebuilds had taken place. Although it could be that the original plan for the outer wagons to be NP19401 to 19404 was not adhered to, NP19401 was certainly an outer when photographed in 1994 . Another change affecting the JHAs was that at least 7 of the batch gained partial repaints. The vertical part of the hopper sides were repainted from blue to EWS maroon. Curiously the upper parts of the hoppers were left in blue, although this was usually hard to tell due to weathering. JHA Outer wagon NP19410 had been partially repainted (note that the top of the hopper sides is still blue) by December 2007. It has since been converted to an inner wagon, rebogied and renumbered as HJA 300410. The allocation of 21 JMAs to pool 4937 (described as "EWS Energy. TF25 bogies") in 2008 is of interest. Rail Express magazine reported that these 21 wagons were fitted with new bogies (at Marcrofts of Stoke) in early 2009, and that they were renumbered as HKAs at the same time . The new bogies were outside-framed Axiom Rail TF25Es and it was suggested that the work was undertaken following numerous derailments. This was later refuted by DB Schenker (as EWS had by then become), who said it was in fact due to economic reasons . The wagons were not repainted and some still retained National Power branding. The 21 wagons were renumbered retaining the last 2 digits from their former numbers. 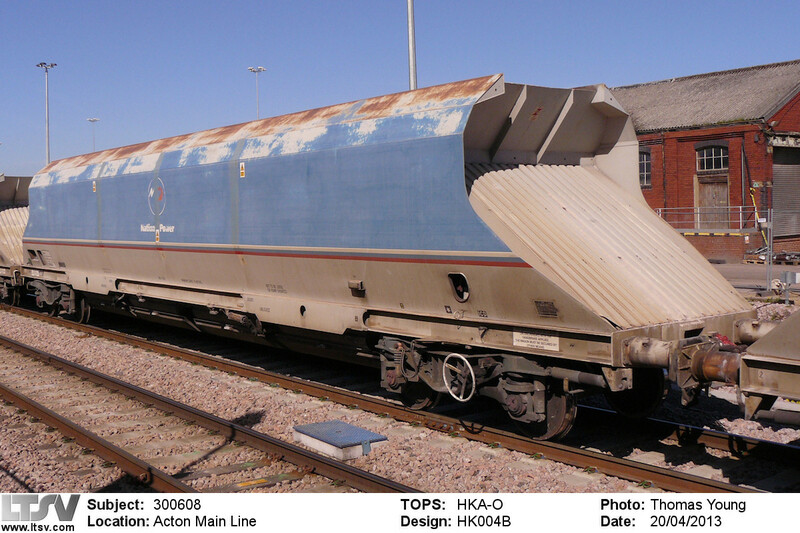 300603/10/18/21/22/23/27/46/47/70/72/79/85 (total 13) were inner wagons now coded as HKA-Is to design code HK004A. 300608/13/39/41/43/50/60/77 (total 8) were outers to HKA-O and HK004B . Of the outer wagons, 300608/13/43/60/77 had previously been inner JMAs, while 300650 had been the unique JMA-S. 300641 had been an inner JMA in 2005 but had apparently already been converted to an outer by 2008. The 21 HKAs were allocated to the Whatley to St Pancras traffic, replacing the JHAs. NP19608 was rebogied and renumbered as HKA-O 300608 in 2008/2009. It was photographed in 2013 still in National Power livery complete with branding. By October 2011 all 21 JHAs were in pool 3995 (DB Schenker Construction. For TF25 conversion), while the 64 remaining JMAs were in 9062 (DB Schenker group. ex National Power) . Only the HKAs remained operational. The next development appears to have been in early 2012, when the JHAs started receiving new bogies. As with the JMAs, these were renumbered into the railway-owned series, this time using the 3004xx range with the last two digits carried over from the previous identity . Once again there was some switching around of the inner and outer wagons. The inner wagons were now coded HJA-I (design HJ001A) and included 300410 and 300413, converted from outer JHAs NP19410 and NP19413. The outer wagons were HJA-Os to design code HJ001B and comprised 300406/14/16/19, of which the latter two were previously inner JHAs . More HKAs were created from spring 2014 when Axiom Rail at Stoke (the former Marcroft premises) released the first 6 of a new batch. The work this time included an overhaul of the body, and a full repaint into DB Schenker's bright red livery. The new bogies were low-noise LN25s, similar to the TF25Es fitted to the earlier HKAs. Perhaps the most unusual aspect of the new conversions was that each wagon now carried two numbers. As well as the 3006xx series numbers, they were also given 'international' numbers in the series 82.70.6723.6xx, once again with the last two digits retained. The wagons also carried the UIC type code of Fabnooss in addition to the HKA TOPS code. The first 6 entered service on Lafarge Tarmac workings from Mountsorrel in May . 20 wagons had been completed by mid-summer, with more heading towards Stoke for attention. In June the batch was switched to working between Crawley and Wembley . The later HKA conversions included a repaint into DB Schenker red livery and also the allocation of additional UIC numbers. NP19626 was carrying new numbers 300626 and 82.70.6723.626-1 when seen at Clapham Junction in 2014. The latest 20 overhauls include 4 outer wagons, 2 of which were latterly outer JMAs (300625/26) and 2 which have been converted from inners (300668/73) .